Home / News and Events / Bird Rock Fit Veg Out Challenge Starts FEB. 1! 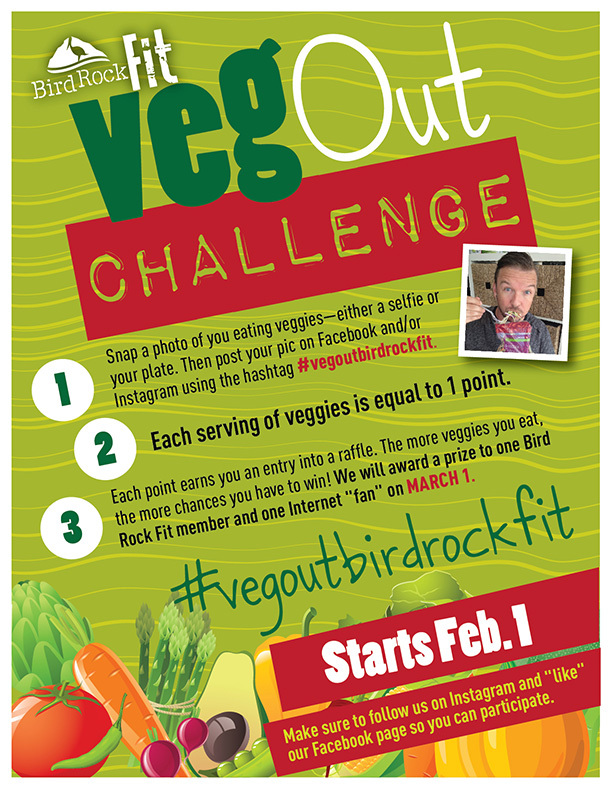 Bird Rock Fit Veg Out Challenge Starts FEB. 1! Bird Rock Fit wants you to eat your veggies! Starting Feb. 1, participate in the Bird Rock Fit Veg Out Challenge and get a chance to win prizes. 1. Snap a photo of you eating veggies—either a selfie or your plate. Then post your pic on Facebook and/or Instagram using the hashtag #vegoutbirdrockfit. 2. Each serving of veggies is equal to 1 point. 3. Each point earns you an entry into a raffle. The more veggies you eat, the more chances you have to win! We will award a prize to one Bird Rock Fit member and one Internet “fan” on March 1. Make sure to follow us on Instagram and “like” our Facebook page so you can participate.